The resurrection on Nalanda University is supposed to mark the beginning of ‘Brand Bihar’. With the Indian Parliament having passed the Nalanda University Bill, the path is now clear for the revival of the oldest university in India (and one of the oldest in the world). 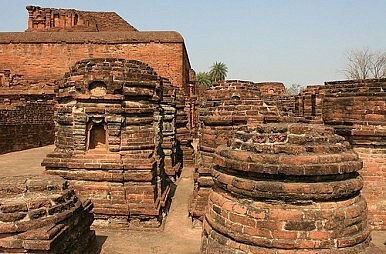 Nalanda University was a seat of learning for about 600 years from the 5th Century to the 12th Century AD. It was eventually sacked and torched by a Turkish ruler, Bakhtiyar Khalji, and it’s said that the university continued to burn for months. And today, it is still just ruins. A couple of weeks ago, I visited an ancient monument at Nalanda that’s located in South-east Patna, the capital of Bihar. The excavated structure demonstrates the grandness of the original university. The layout—including a library, dormitories for students, a teachers’ area, meditation points, large halls and classrooms—suggest that about 10,000 students were at one point resident here. My guide told me that much of the old university has yet to be excavated. This Buddhist educational institution attracted students not only from across India, but also from different parts of Asia. A range of subjects including mathematics, philosophy, languages and public health were taught, with Hieun Tsang, a Chinese traveller who visited the University in the 7th Century, providing one of the most important accounts of the university’s activities from the time. It’s the international character of the university, as well as its Buddhist heritage, that has attracted some Asian countries into the plans to revive the university. The Mentoring Panel, which was set up by the Indian government under the chairmanship of Nobel Laureate Amaratya Sen, includes Singaporean Foreign Minister George Yeo, historian Sugata Bose, Lord Meghnad Desai and Chinese academic Wang Banwei. The cost of constructing the new grounds is estimated at about $500m, while an additional amount of about the same is expected to be required to improve the surrounding areas. Bihar Chief Minister Nitish Kumar has linked the resurrection of the ancient university to the building of ‘Brand Bihar’ and the ‘Revival of Bihari Pride’. And there’s no doubt that reviving an ancient seat of learning that predates Oxford and Cambridge universities is a great step forward. But when looking around educational institutions already built in Bihar, it’s difficult to feel inspired. In an earlier blog entry, I talked about the terrible condition of RD & DJ College in Munger, which just two decades ago was one of the prime educational centres in the district. And if you visit the campus of Patna University, despite it being the best university in Bihar, the students there don’t sound particularly confident. In fact, last time I interacted with students on the campus, they told me there seemed to have been a steep decline in teaching standards at the university. It’s clear to me that revitalizing education in Bihar must be about more than just reviving an ancient university—modern centres of education, once the pride of Bihar, also need to be improved. Until they are, the educational, academic and literary atmosphere that used to be the pride of Bihar is missing. If the revival of Nalanda University is approached as part of a multi-pronged effort to restore existing centres of education to create modern institutions, Bihar can once again become a leading state, just like it was back in the days of the Magadh and Maurya empires. An innovative project in a small Indian village is empowering young women and changing the lives of villagers.